Investment in industrial 3D printing is booming. Over the past 12 months, hundreds of millions of dollars have been poured into the industry — with newer companies benefiting from the influx of funding. In the first quarter of 2019 alone, major funding announcements included Desktop Metal ($160 million), Markforged ($82 million) and 3D Hubs ($18 million). With the additive manufacturing industry attracting ever more attention from investors, what does this mean for the future of 3D printing? The early 2010s was marked by much excitement and hype around 3D printing. This was, in part, fuelled by the expiration of various patents and the promise of the consumer 3D printing revolution. This revolution, proponents said, would bring 3D printers into every home, empowering consumers to 3D print objects on demand. Caught up in the hype, new companies began to flood the market and investors poured millions into 3D printing stocks. Market valuations of 3D printing companies skyrocketed. The stock prices of two of the largest 3D printer manufacturers, 3D Systems and Stratasys, reached a high of around $100 per share and $136 per share respectively. 3D printing, it seemed, was on the cusp of a new technological revolution. But the excitement was premature and, of course, the consumer 3D printing revolution failed to materialise. In spite of the huge bets placed on consumer 3D printing, the concept of 3D printing at home, whilst alluring, was mired in a misjudgement of the landscape. For one thing, the 3D printers were not as user-friendly as many would have liked them to be. But more importantly, there never truly developed the critical consumer application that would enable home 3D printing to truly take off. As a result, between 2014 and 2016, the consumer 3D printing market shrank considerably. Not only did many of the new companies — particularly desktop 3D printer manufacturers — ultimately fold, but investors also saw their stock values take a nosedive. Fast forward a few years: according to industry research firm, Smartech Publishing, the 3D printing market grew to $9.3 billion in 2018. By 2022, the same report predicts that the industry will grow to $20 billion, pointing to a very positive future for the industry. But where has this resurgence come from? The answer: industrial 3D printing. Although the vision of a consumer market for 3D printing didn’t live up to its promises, 3D printing has emerged as a promising technology for industrial manufacturing. As the technology has advanced, 3D printing is successfully being used for applications as wide-ranging as prototyping, tooling and, increasingly, end parts. And while 3D printing currently represents only a small percentage of the overall $12 trillion manufacturing industry, there is confidence that over time, the proportion of additively manufactured parts is only set to grow further. That said, it’s important not to fall into the same trap that occurred during the consumer 3D printing hype. Industrial 3D printing will not replace conventional manufacturing methods, at least not anytime soon. Rather, it is a complementary technology that is offering new design possibilities, opening up new applications and reducing production costs. Unsurprisingly, the potential of 3D printing, as it gears towards real-world industrial applications, is very appealing to investors. In 2018 alone, there were 107 early-stage investments made in 3D printing, valued at nearly $1.3 billion (Wohlers Report 2019). And while we may only be 4 months into 2019, the year has kicked off with several funding announcements already exceeding $250 million. Clearly, the overall additive manufacturing market is experiencing a revival. But which AM segments are attracting the most attention from investors? As additive manufacturing has shifted to production, there is a lot of excitement around 3D printing systems. High-volume production, with lower costs and faster speeds, has been the holy grail of 3D printing. To achieve that vision, hardware manufacturers are increasingly developing new systems geared towards production. This has been the case for Boston metal 3D printing startup, Desktop Metal, said to be “the highest funded private 3D printing endeavour in history”. With leading 3D printing scientists and metallurgists as part of its team, including Ely Sachs, inventor of the binder jetting process, and Paul Hoisington, who invented the single-pass inkjet technique for the 2D printing industry, Desktop Metal is betting big on the technologies and expertise it has developed. 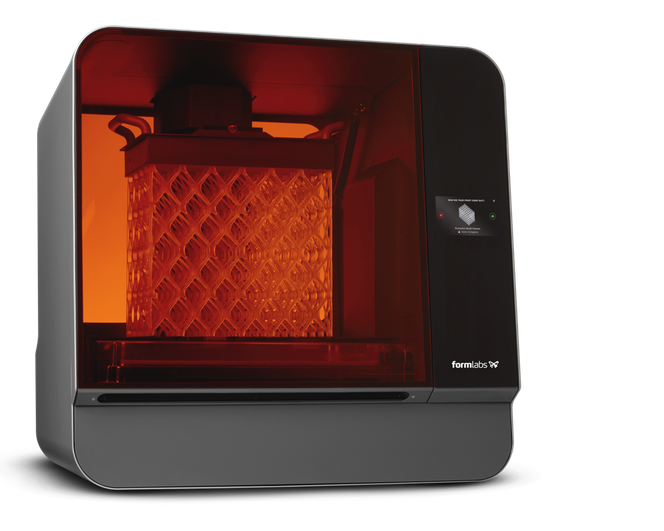 Now shipping its desktop Studio System 3D printers, the vision behind which is to democratise metal prototyping, the company plans to release its Production System later in 2019. In contrast to the desktop Studio System which is geared towards low-volume runs, Desktop Metal believes its Production System will transform the way in which metal parts are produced at scale. The Production System uses a reinvented binder jetting process, called Single Pass Jetting (SPJ). This technology is faster compared to laser-based systems and is said to be able to compete with traditional manufacturing methods such as casting. Arguably, the most important factor in Desktop Metal’s whole process is a decision to use Metal Injection Molding (MIM) powders. Using MIM powders opens the door to a raw material base that is already well-established and widely available, as materials are much cheaper than those used in other powder-bed processes like DMLS. Combine this with a fast and scalable process and you get greater economies of scale. These technological advancements have been resonating with the company’s investors, who, at the start of 2019, provided an additional $160 million funding, bringing Desktop Metal’s total funding to $438 million. As a result, Desktop Metal’s estimated valuation of Desktop Metal to $1.5 billion, making it one of the few 3D printing companies to have reached unicorn status. Time will tell if the manufacturer’s claims are proven over the course of beta and commercial releases. If so, the Production System will have earned its title as the fastest, most disruptive metal 3D printer available. Capital injections are often the key to driving a technology forward. Carbon is perhaps one of the most prominent examples of how technological innovation, backed by funding, can bring 3D printing closer to high-volume manufacturing. For a startup to reach unicorn status in less than a decade is no mean feat. However, Carbon, founded in 2013, is another 3D printing company to have done just that, having reached a valuation of $1 billion after their Series C raise in 2015. To date, the company has raised $422 million in venture funding and currently has a valuation of $1.7 billion. 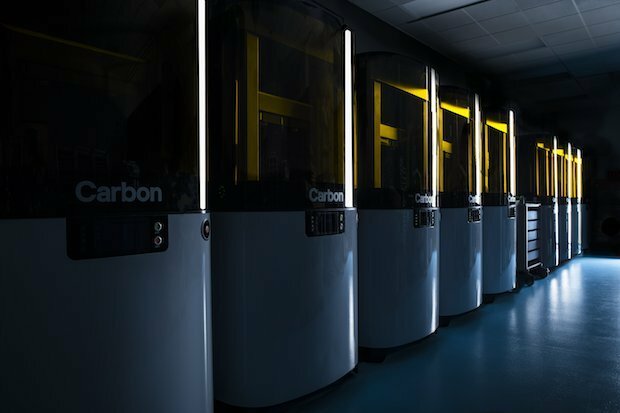 The key driver behind Carbon’s success lies in its proprietary Digital Light Synthesis™ (DLS) technology, which aims to take the production of 3D-printed parts to new heights. DLS is a novel take on photopolymerisation technology, wherein a light-sensitive resin solidifies upon exposure to a UV light. However, unlike other similar techniques, DLS uses an oxygen-permeable window through which the light is cast onto the liquid resin. Thanks to this window, objects are printed continuously, without visible layers. As a result, parts produced with DLS have great surface quality, are isotropic and can be used with a wide range of engineering-grade materials. For investors, Carbon’s technology offers an exciting opportunity. Not only is the vision grand — enabling high-volume production across industries — the technology has proven to work in a number of high-profile use cases. Take, for example, Carbon’s foray into 3D-printed midsoles for sportswear in its highly publicised partnership with Adidas. Or, its partnership with Ford Motor Company, where the automaker successfully used Carbon’s DLS technology to produce a number of automotive parts. Being able to show a workable, scalable digital 3D printing platform, one that is continuously proving its viability for production, has, therefore, put Carbon into a focus for many investors. And Carbon isn’t stopping there. Having launched its larger L1 3D printer earlier this year, it looks like the company is ramping up its efforts to position itself as a market leader for digital manufacturing. 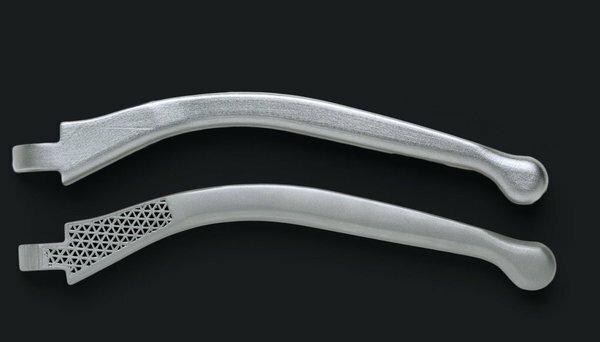 Markforged is another hardware company helping to establish 3D printing as an industrial solution. Markforged first appeared in 2013, and a year later the company introduced its first composite 3D printer – the Mark One. The system was the world’s first 3D printer capable of printing parts reinforced with continuous carbon fibre thus bringing unseen strength to polymer 3D printing. Four years later, the company expanded its scope to include metal 3D printing, releasing its Metal X 3D printer at the start of 2018. Priced competitively at just under $100,000, Metal X sparked new possibilities in metal 3D printing, making it a much more affordable option compared to traditional million-dollar metal 3D systems. The introduction of the Metal X has drastically reduced the barriers to entry for businesses who wanted to try but previously couldn’t afford to own their own metal 3D printing systems. Stronger 3D-printed polymer parts and cheaper metal 3D printing have seen a great demand across the manufacturing industry. In 2018 alone, Markforged has reportedly shipped over 2,500 industrial 3D printers, earning the status of one of the fastest-growing technology companies in North America. The recent $82 million round of investment comes, therefore, as no surprise, with the company now looking to develop new products and bolster its global presence. The stories of companies like Carbon and Markforged point to a wider trend within the additive manufacturing industry — the continuing growth of polymer 3D printing. Over the last twelve months, several new companies developing technologies specifically for polymer 3D printing, such as Evolve Additive Solutions, Origin and Fortify, have received millions of dollars in funding and are now preparing to bring their products to the market. But arguably the most impactful investment over the last year has been in Formlabs. In the summer of 2018, the company received $15 million following a $30 million raise in April of the same year, bringing its total funding to date to $100 million. Formlabs began as a Kickstarter campaign back in 2012, but has now established itself as one of the most successful manufacturers of SLA systems. The company was founded with the goal of bringing lower-cost, high-quality professional SLA printers on a desktop. To meet this goal, the company developed the Form 1 3D printer, small enough to fit in an office environment but comes at a fraction of the cost of industrial SLA machines. 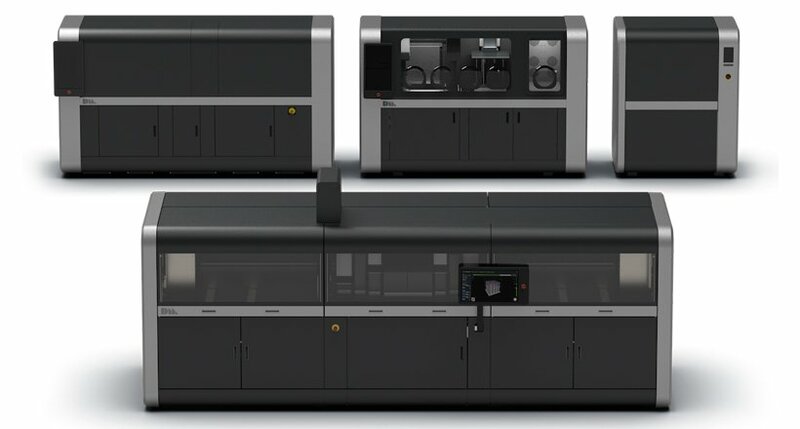 Since then, the company has launched three versions of its desktop SLA printer, with the latest 3D printers — the Form 3 and the large-format Form 3L — introduced earlier this month. In addition to SLA, Formlabs has also stepped into the SLS sphere with the introduction of its Fuse 1 desktop SLS system. 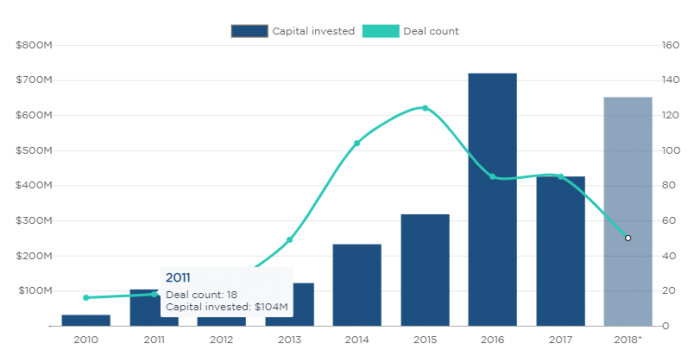 With an annual growth rate of almost 100% for five consecutive years, Formlabs has reached a valuation of $1 billion, thus entering the unicorn club alongside Carbon and Desktop Metal. While hardware seems to get the biggest piece of the investment pie, there has also been a lot of interest in on-demand additive manufacturing platforms. Such platforms offer users access to a network of 3D printing service providers, enabling manufacturers to produce parts faster and closer to the point of need. As their networks and the services they provide expand, the platforms could ultimately become a very large driver in the evolution of the manufacturing supply chain. This future potential is a key driver behind the growing interest in on-demand manufacturing platforms among investors. One example of such a platform is 3D Hubs. The company, founded in 2013, began as a community-based marketplace, where anyone owning a 3D printer could sell their 3D printing services online. However, to much media fanfare, 3D Hubs has recently shifted its focus to the B2B industrial space. It now serves a professional market, establishing a network of manufacturing partners. It also offers access to traditional manufacturing services, like CNC machining and injection moulding, in additon to additive manuacturing. The culmination of this business focus and strategy may have gone some way to helping the company raise $18 million in Series C funding, and will likely help the company to complete its transition to the new business model of on-demand manufacturing. 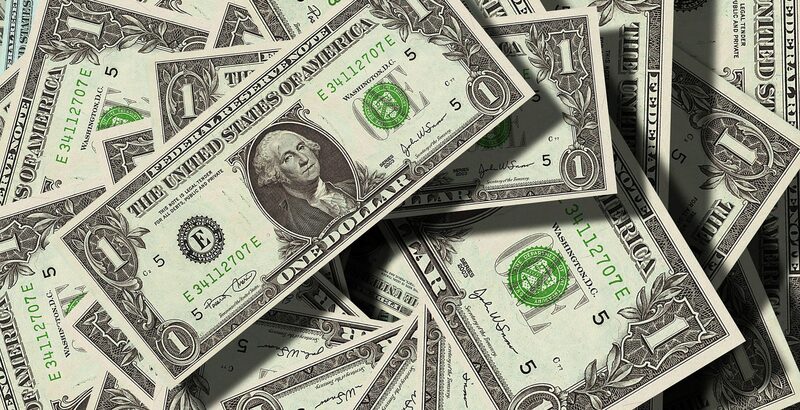 3D Hubs is not the only company receiving funds to advance digital manufacturing. US companies, Fictiv and Xometry, which offer similar platforms, have also received investment as they aim to captialise on the multi-billion on-demand manufacturing market. In addition to 3D printing, all of these platforms provide other manufacturing services, including machining and injection moulding jobs. Placing 3D printing services alongside conventional manufacturing solutions is yet another signal of 3D printing finding its place in the wider manufacturing market. Ultimately, building a global network of service providers plays well into the growing trend of distributed manufacturing. This new approach to manufacturing evolves around decentralised production sites, which enable manufacturers to produce goods close to, or at the point of use. The result is simplified and minimised supply chains, faster delivery and greater flexibility in production. With the recent investment rounds, it looks like this trend will only become stronger. Investments into new technologies and digital manufacturing services are indicative of 3D printing’s impact on the wider manufacturing landscape. That said, they’re just the tip of the iceberg, as new funding and investments are made virtually on a weekly basis. 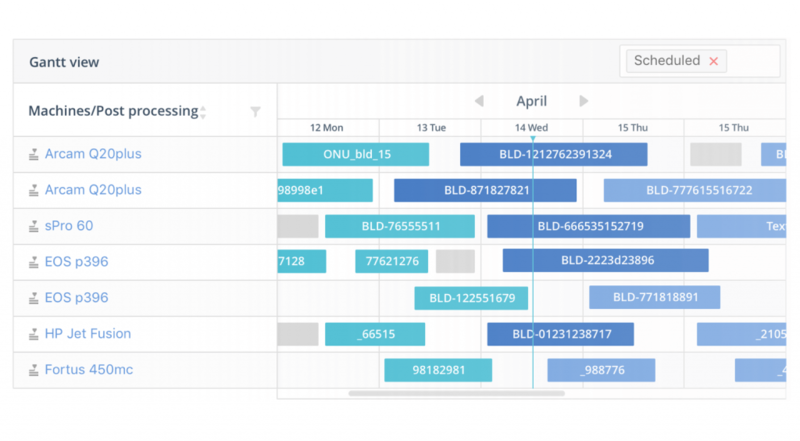 In the world of manufacturing services, contract manufacturer Fast Radius recently announced an impressive $48 million raised in a Series B funding round. Fast Radius offers its customers a range of solutions aimed at discovering potential applications for 3D printing and bringing them to life at its smart factories. Thanks to the combination of the latest 3D printing and digital technologies, Fast Radius’s services are said to excel in speed and quality, helping to increase the company’s appeal to investors. And being named by the World Economic Forum as one of the nine ‘best factories in the world’ certainly doesn’t hurt. For example, we recently announced our Innovate UK funding earlier this year. This investment will help us to further advance our AI solutions for our end-to-end workflow software platform, particularly in the areas of production scheduling and quality assurance. Looking at the bigger picture, 3D printing is a rapidly-growing industry — growth driven by a new generation of 3D printing companies offering innovative solutions and technologies. The increase in investment will only further drive innovation. Indeed, investors, buoyed by the industrial potential of 3D printing, are becoming increasingly confident in its ability to bring a return on investment. Within this new, industrial context, the future is certainly bright for industry players and investors alike.